News from 2000 | Doris S. Michaels Literary Agency, Inc.
Mary Ellen O’Neill at Hyperion has laid out a very substantial sum (believed to be over six figures) to retain best-selling business authorJeffrey J. Fox (How to Become CEO). It was a three-book deal, negotiated by agent Doris S. Michaels, the first fruits of which will be How to Be a Great Boss, scheduled for May 2002. Meanwhile, the CEO book and How to Be a Rainmaker are successful backlist titles, and his next, Don’t Send a Resume, is due next May, with a planned first printing of 75,000. Michaels kept U.K. and translation rights, as well as audio and dramatic. Jeffrey J. Fox’s “How to Become CEO” was a big seller for Hyperion a couple of years ago, and “How to Be a Rainmaker” was a successful follow-up last spring. The house, in the person of editor Mary Ellen O’Neill, has now made a strong vote for a continued relationship with the author by signing a three-book deal for what it characterizes as a “very substantial sum,” believed to be as high as seven figures, with agent Doris Michaels for North American rights. Fox’s first new title will be “How to Be a Great Boss,” scheduled for May 2002. He still has one book left on his old contract, “Don’t Send a Resume,” scheduled for next May with a first printing of 75,000. The Doris S. Michaels Literary Agency, Inc. is very happy to announce a deal with Hyperion for a very substantial sum for the next three Jeffrey J. Fox titles. Given the international success and recent Wall Street Journal bestseller listings on December 1st, 2000, of both HOW TO BECOME CEO (published October 1998 as a strong backlist title with close to 200,000 in sales and available in over 20 languages) and HOW TO BECOME A RAINMAKER (published May 2000), and the substantial interest in DON’T SEND A RESUME with a planned 75,000 first printing (to be published May 2001), Hyperion has made a commitment to continue this successful “Contrarian” series with these three additional books beginning with a book for managers called HOW TO BE A GREAT BOSS (slated for May 2002). The agent has retained all of the translation (including British Commonwealth), audio and dramatic rights on behalf of the author. 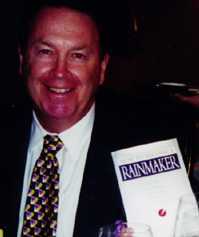 To order HOW TO BECOME CEO or HOW TO BECOME A RAINMAKER, please go to the “Our Books” page and click on the book cover. It’s not often that a novel published by a small press is nominated for the National Book Award, but that was the case last year with “Hummingbird House” by Patricia Henley, published by small Colorado house MacMurray & Beck. Now agent Faye Bender at the Doris Michaels agency has made a six-figure sale of a new Henley novel, “In the River Sweet,” to Luann Walther at Pantheon. Walther pre-empted for world rights, for both a Pantheon hardcover and an Anchor paperback, on the basis of a few pages of a partial manuscript. Dianna Booher, a consultant who has written more than 40 books and who, for her savvy at business correspondence, has become known as the “Miss Manners of memos,” has now turned to e-mail and how we should all conduct ourselves in it. The sale was made by Doris Michaels of her own agency, and she tells us that, appropriately for such a subject, the e-rights were split, with S&S getting verbatim electronic and Michaels hanging on to e-adaptation (as well as translation and movie). Ivers got world English, and plans to publish next February. New York – On Wednesday, August 2, 2000, a publication party was held in honor of Maury Allen’s new book entitled ALL ROADS LEAD TO OCTOBER: BOSS STEINBRENNER’S 25-YEAR REIGN OVER THE NEW YORK YANKEES. St. Martin’s Press published the book in June with the help and hard work of Editor, Joe Veltre and Agent, Doris Michaels. The party was held at legendary sports restaurant, Mickey Mantle’s. Some attendants included Frank Torre, brother of Yankee manager Joe Torre, a former big leaguer with the Milwaukee Braves, and an old friend of Maury’s for 50 years from James Madison High School, Brooklyn, New York; Phil Linz, Yankee shortstop for several years when Yogi Bera was Yankee Manager; Vic Ziegal, columnist, New York Daily News; Stan Isaacs, columnist, Newsday, New York; Richard Kaplan, former editor of Ladies Home Journal, now executive editor of Star Magazine; Metropolitan Opera singing star, friend of Steinbrenner, and long time baseball fan, Robert Merrill; famed writer and broadcaster for baseball and boxing, Bert Randolf Sugar; CBS sportscaster Warren Wolf; Marty Appel, former publicity of the New York Yankees and now president of his own PR firm; and Arthur Richman, vice president of the New York Yankees, representing George Steinbrenner who was out of town on business that night – just to name a few! Others in attendance were friends, family, representatives from St. Martin’s Press and from the Doris S. Michaels Literary Agency, Inc., and of course, a few fans. The party was a fun and memorable event celebrating America’s greatest pastime. To order this book or any of our titles, please go to the “Our Books” page and click on the book cover. Jeffrey Fox’s first international bestseller entitled How to Become CEO is currently in its 12th printing and available in over twenty languages. His new book entitledHow to Become A Rainmaker is sure to be another mega-seller with many rights deals in place. Jeff Fox has helped set the standard for the Doris S. Michaels Literary Agency, Inc. In addition to translation rights, audio rights, dramatic rights, online rights, and other subsidiary rights, the agency now handles representation for Jeff Fox along with our other bestselling authors for keynote speeches. C-SPAN 2 will air the Women’s National Book Association (WNBA) panel entitled Powerful Women In Publishing: Rising to the Top on Sunday, May 28, 2000 at 12:00 noon Eastern Standard Time. The show will rerun at 12:15 AM on Monday morning. The panel will be featured on The Business of Books section which runs on Book TV the last Sunday of every month. A tape of the program can be ordered at 1-800-277-2698 for $29.95 each copy. Pictured below: Front row, left to right: Maureen Egen, Carole Baron. New York — The Women’s National Book Association (WNBA) hosted a panel discussion entitled “Powerful Women in Publishing: Rising to the Top” on Tuesday, April 18th, 2000 featuring Carole Baron, President of Dutton and Executive Vice President of Penguin Putnam; Maureen Egen, President of Time Warner Trade Publishing; Martha Levin, Vice President and Publisher, Hyperion; and Sally Richardson, President and publisher, St. Martin’s Press. The panel took place in the Time & Life Building and was moderated by Doris Michaels of the Doris S. Michaels Literary Agency and Kristine Puopolo, Editor of Trade Paperbacks for Simon & Schuster. The purpose of the panel was to ask some of the most powerful women in the publishing world how they made their way to their current positions. 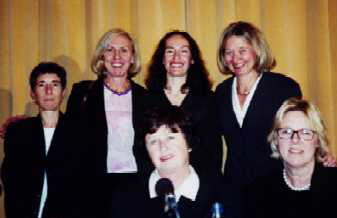 Though their backgrounds were diverse, their message to aspiring future publishers and presidents was consistent: the women encouraged the attentive audience to learn as much as they could by asking lots of questions, experiencing as much as possible and to “just make decisions” whether right or wrong to move forward, as long as one learns from mistakes and avoids making the same mistake again. None of the women had followed one simple course to move toward their goals, but all have had a deep personal conviction to make the work they love evolve into a career they can depend on. C-SPAN was there to film the event for future showings on Book TV. We will announce the date and time of the initial airing as soon as the schedule is made public. New York — Doris Michaels will moderate a panel of at least four of the top women in New York publishing to talk about their rise to leadership within the corporate structure. The discussion is hosted by the Women’s National Book Association at the Time & Life Building, 1271 Avenue of the Americas on April 18th from 6 to 8 PM. Admission is free for WNBA members, $10 for nonmembers, $5 for students. Joining the panel are top women from prestigious companies including Time Warner, St. Martin’s Press, Penguin Putnam, and Hyperion.